"Pukht means cooking in a Clean area..." he said in his Chaste Urdu. His voice low yet reached every corner of the room as the guests hanged on to his words in pin drop silence. "and Dum means to cook in its own flavour' he added with a grin. That's master chef Imtiaz Qureshi for you. 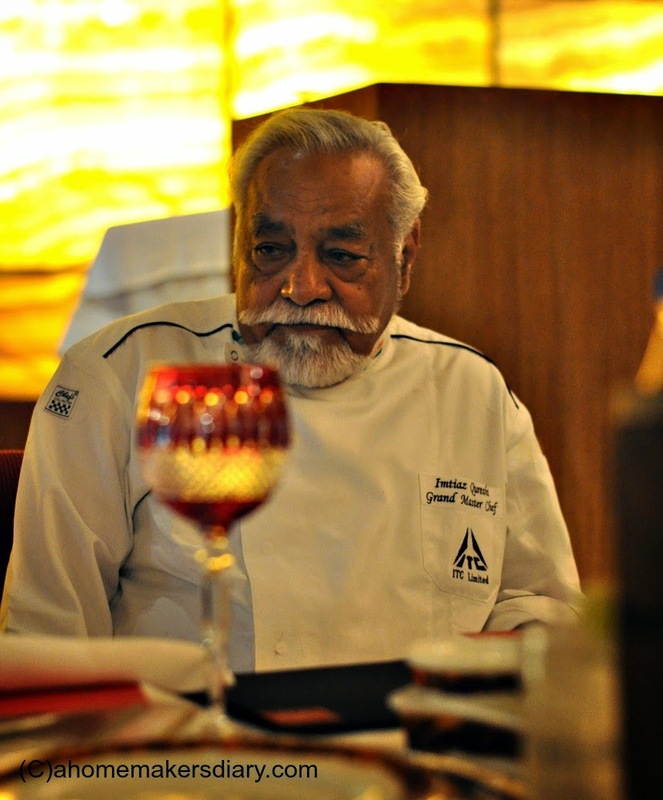 The 85 year old living legend who weaves magic with taste, flavour and texture when it comes to Awadhi cuisine. Whi is also the man behind ITC Hotels’ celebrated Dum Pukht chain of restaurants. The event was the press lunch at the fine dining Indian restaurant of ITC sonar, The Dum Pukht, where they introduced a set menu of five courses crafted by the master himself. 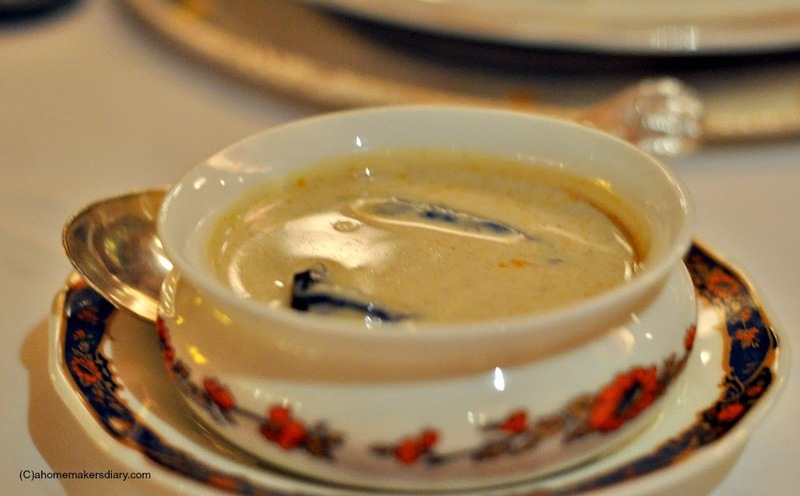 This unique set called the 'Royal repast with Chef Qureshi' has a selection of shorba, kebab, qorma, salan, nehari, naan and meetha to sample from. 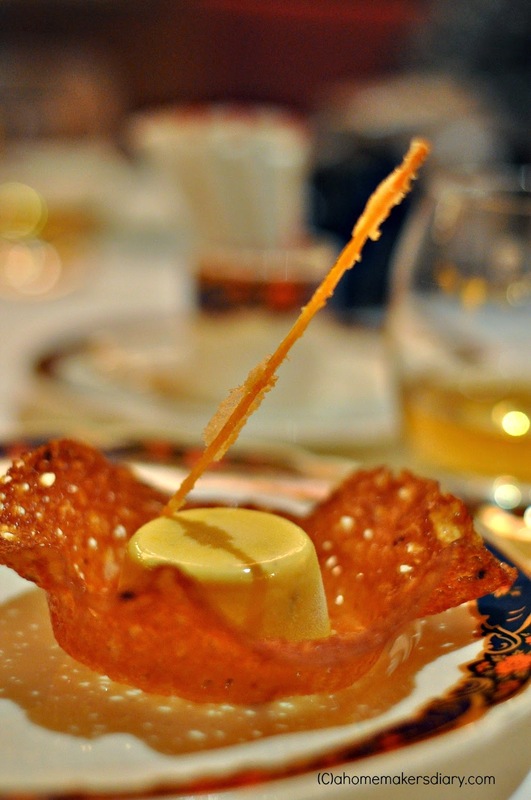 This 'royal' menu is beautifully paired with Royal Salute 21 YO by whiskey expert Sandeep Arora. 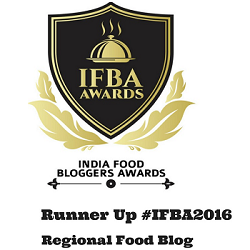 Its an effort by ITC to always showcase 'the Globe's best Indian cuisine and India's finest global cuisine'. 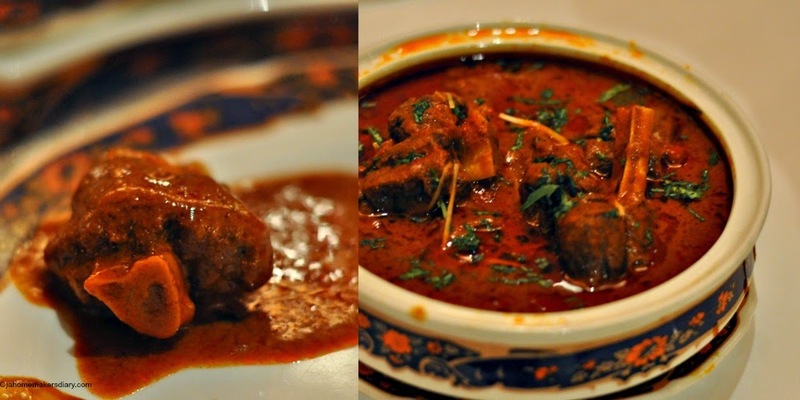 being true to that effort this signature collection at Dum Pukht is truly a Nawabi Dawat experience (Royal feast). Here one is guided through the menu and each dish is presented with a piece of history and signature service rituals.The carving of the Raan or breaking of the Pardah (the seal of the biriyani pot) is a big part of this ethereal experience. 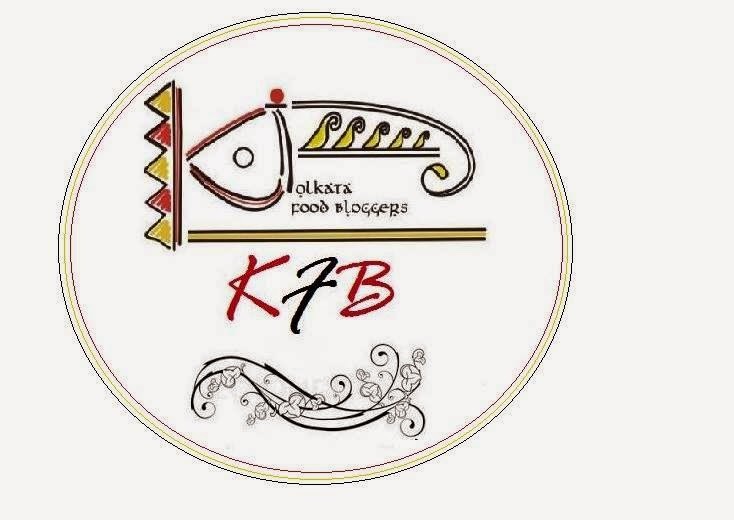 But for us KFBians, the food enthusiasts, tasting a meal created by Chef Qureshi is like a dream come true. And we all were in awe when he stepped in. 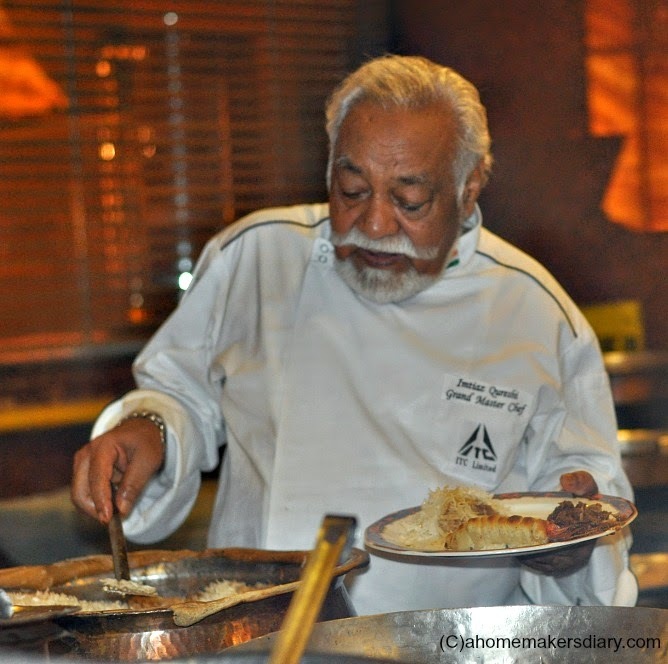 With his impeccable Chef white, handlebar moustache and neatly combed silver hair the man looked every bit the part of his royal lineage, an ancestry traced to the kitchens of the Royal courts of Awadh where Dum Pukht cooking originated some 200 years ago. For the uninitiated, 'dum pukht' is a sophisticated, leisurely method of slow cooking, where food is tightly sealed in a specially designed, heavy bottomed copper Degh (pot) to cook in its own juice and flavour. This slow roasting lets each herb and spice gently release its aroma, whereas the meat tenderizes and matures in the most delectable way. The end result is a culinary style that ensures intense flavour and succulent, falling of the bone meat. 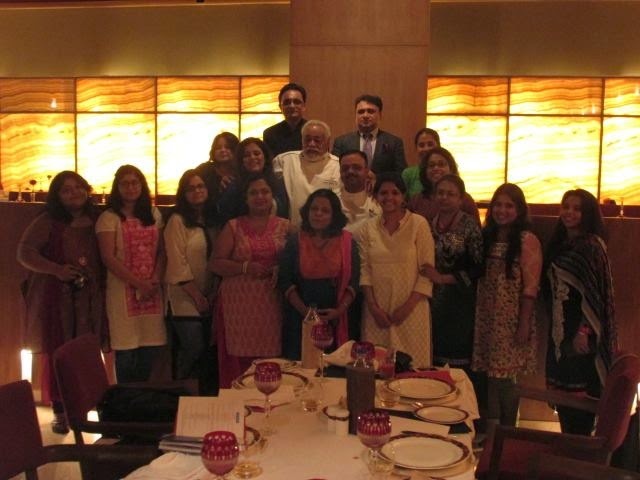 This unique leisurely cooking method has enjoyed royal patronage for the longest time and Chef Qureshi is the man who extensively researched this forgotten cuisine and popularized it across the nation. He is the biggest exponent of the tradition of Awadhi cuisine but what sets him apart is his constant desire to innovate, improvise and experiment . He is always ready to work in unusual manners, doing something new to a traditional recipe without hampering the actual taste and flavour. Think of Olive oil in Dum cooking or use of tamarind and raw mango extract...he is not afraid to try new things and this handcrafted personalised menu of 'Royal repast' beautifully showcases that. The USP of this menu in my opinion lies in its personalisation. Every bit of the menu is crafted with great thought, yet ready to change to suite guest's specific food requirements. 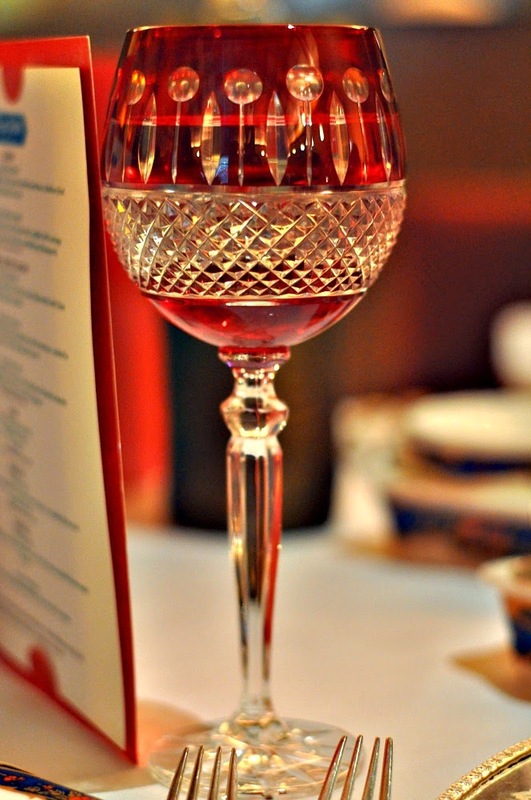 While serving, the guests are guided through the cooking methods, ingredients used and are enthralled with bits and pieces of history and interesting anecdotes. The impeccable choice of bread, kebab and condiments perfectly complements each other. 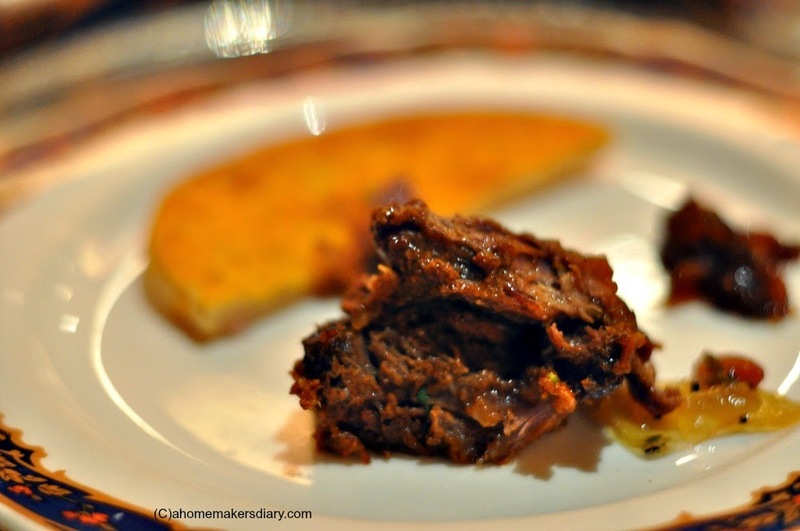 For starter we were served Raan-e-huzoor, baby lamb legs cooked on dum with a thick date sauce with almonds and walnuts. This is an inspired dish, said the Chef, who wanted to impart the sweetness of the dates after the prophet who sustained on dates in the harsh deserts of Arab. This, undoubtedly was the dish of the day with fork tender, juicy lamb meat perfectly balanced with a sweet and sour date sauce. 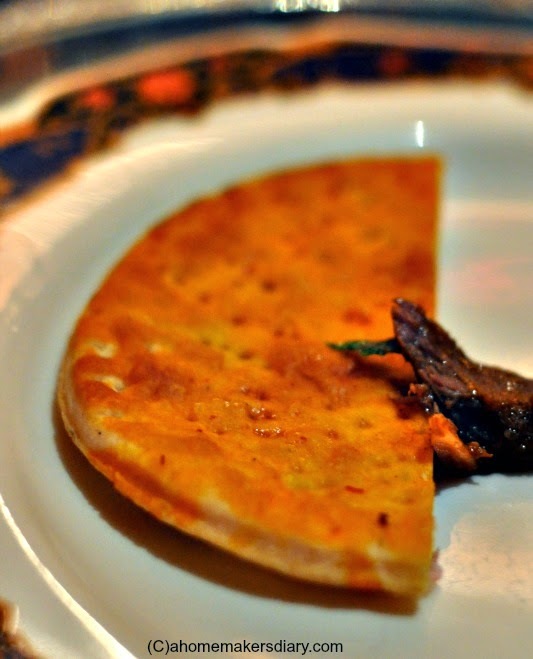 Sheermal, the saffron crusted Lucknowi bread complemented the kebab beautifully. Next came the Jhinga Qureshi, one of Chef's innovative and unique concept. 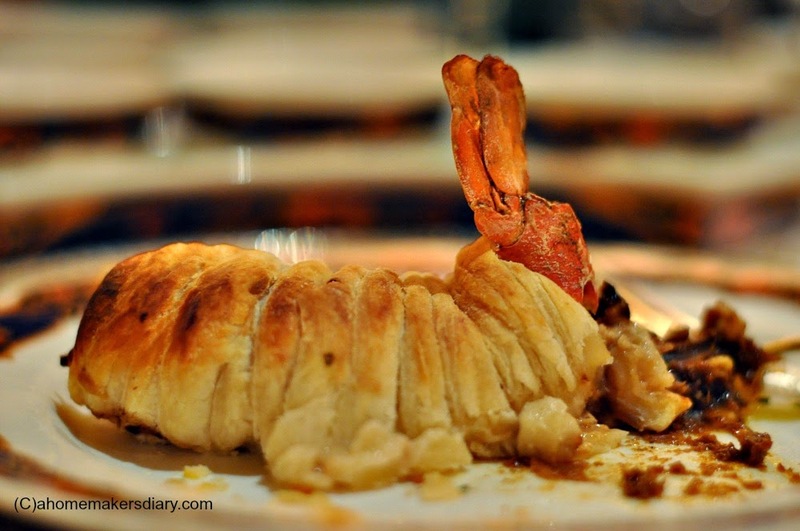 The crunchy puff pastry coated jumbo prawns has a very delicate stuffing of cheese and apricot. The crunchy puff pastry presented perfect backdrop for the delicate prawns inside and was perfectly balanced by the sweet and salty stuffing. Though I found the Prawn little rubbery but the flavours of this dish were exceptional. The Main course comprised many surprise element. Samudri Ratan, The fresh crab meat koftas simmered in a delicate fenugreek flavoured gravy had a beautifully balanced tangy taste which is very uncommon to Awadhi cuisine. They have used tamarind and raw mango extract for this dish. 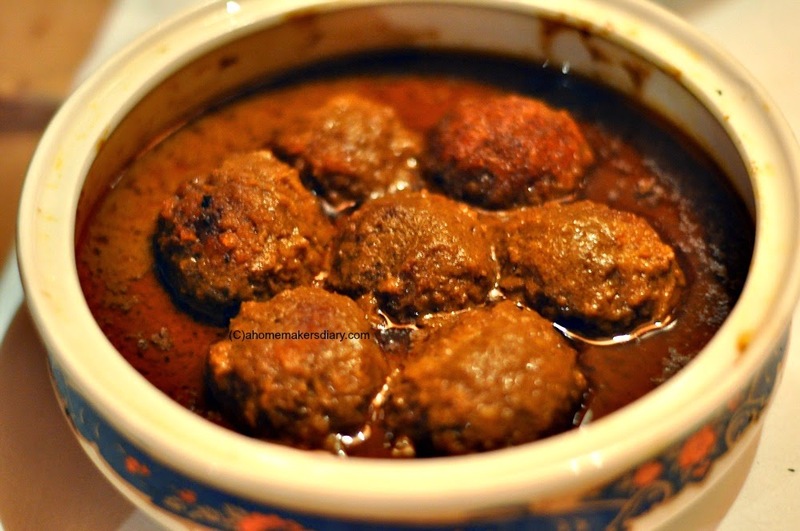 With the soft melt in the mouth koftas, this dish only needs some rice to complete a perfect meal. Desi Murgh ishtew, is not the regular stew rather a royal representation of the dish prepared with country chicken and whole spices. The slow cooking imparts a velvety texture to this dish and it glides through your taste-buds without being heavy. Perfectly soft whole wheat Roomali rotis were served with it to mop up the creamy gravy. Koh-e-Awadh or the lamb shank Quorma is cooked on dum for 4-5 hours in its own cardamom flavoured juice, marrow and saffron. I hardly ever have tasted such soft and tender meat literally falling of the bones. It was a delight for the palate. Dal Badami or slow cooked urad dal with Almonds and spinach blew our mind. 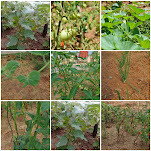 Who needs non veg when veg could be that tasty. I can live on this dill flavoured dal with the naan-e-bah khummach it was served with. The highlight of the day the Dudhiya Biriyani came next. The pristine white lamb biriyani had all the intense flavours of biriyani yet was different in so many ways. With its perfectly cooked highly aromatic basmati rice, succulent morsels of meat, carefully chosen spices it had a very delicate melt in your mouth texture that only Chef Qureshi's recipe can create. I was amazed to know that this was cooked in a very healthy way using Olive oil. The Biriyani was complemented perfectly with Burhani Raita, Garlic and toasted jeera flavoured yogurt. 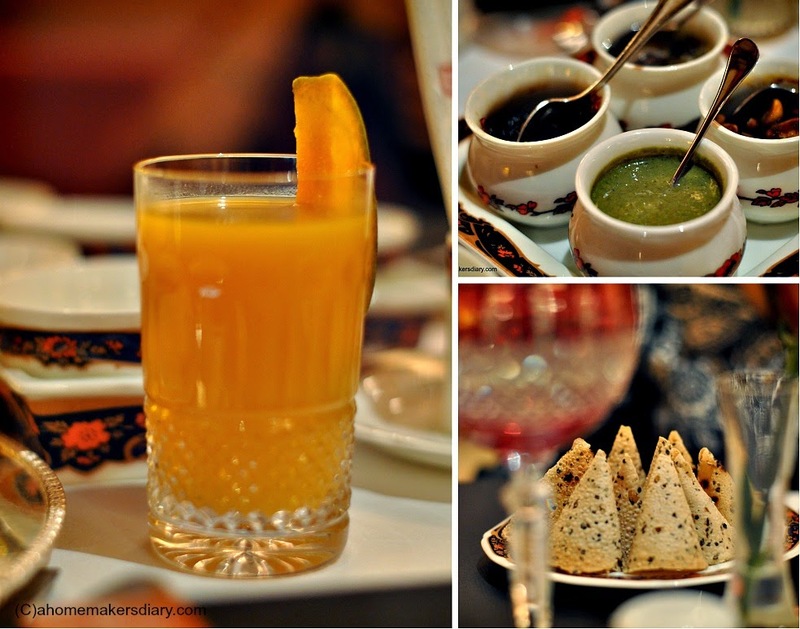 Lab-e-Mashooq, orange scented kulfi on a sugar lace were perfect to finish the meal. The whole food experience was paired with Royal salute 21YO, Scotch whiskey. 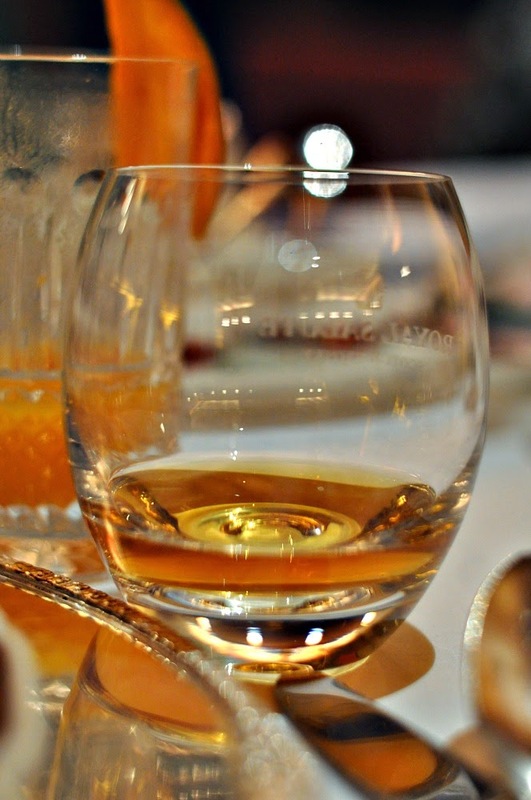 Mr. Sandeep Arora, the whiskey expert had worked for more than three months to present this unique combination of Royal repast menu and 21 year old Whiskey from the house of Chivas. For definite reason I had to excuse myself from drinking that afternoon but loved this fresh approach of matching whiskey with Indian food. Their vegetarian fare consisted of Dudhiya kebab, Hara Kebab Awadhi, Paneer Qaliyan, Gunch-wa-qeema, Dum ki kumbh and Subz Biriyani other than the breads and desserts. Through out the meal the Chef himself and his team came to our table and guided us. with his insistence to eat more he looked every bit of our loving grand father. That's the essence of true Indian hospitality and something that makes fine dining an experience in itself at ITC. 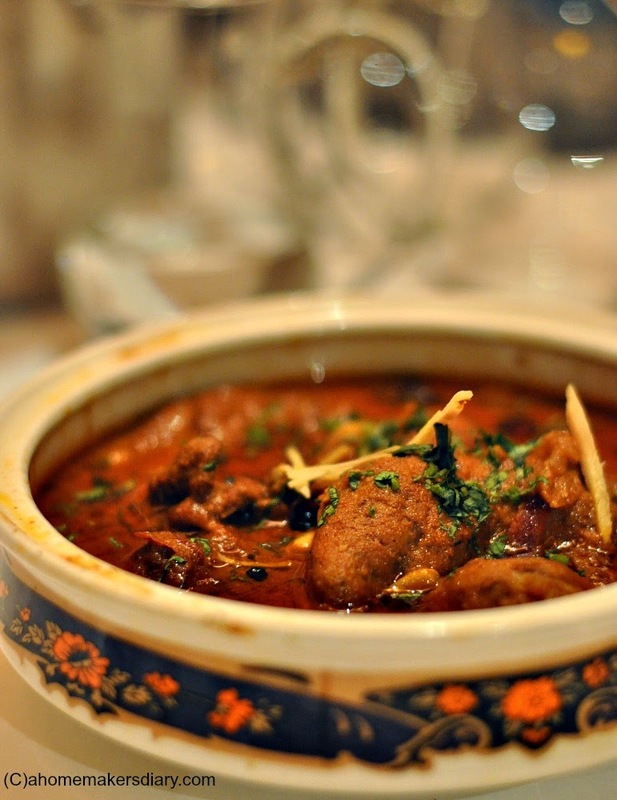 Royal repast at Dum Pukht is available only for dinner at a price of Rs 6,500 plus taxes per person from June 22nd. Whereas the Signature Collection at Eden Pavilion is available from June 22-30 (dinner only). It is a part of the Dinner Buffet, which is priced at Rs 1,850 plus taxes per person. Omg, u guys are soo lucky to meet him and enjoy those wonderful foods there..